My name is Gary Kurtz. 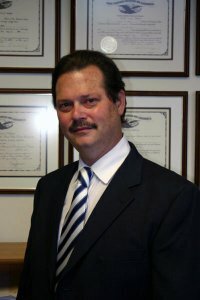 I am an attorney in Woodland Hills, California. My law practice is focused on civil litigation with a concentration on Internet-related and "cyberspace" conflicts. I am responsible for freezing the ownership of YippieMuseum.com and having it re-registered it in the name of my Law Office. I did not seize this website because I am opposed to the "Yippie Museum" or the Yippie ethos. I am neutral on both. 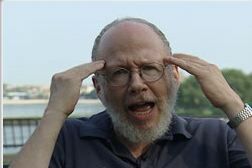 I also did not take possession of YippieMuseum.com to silence the prior operator of this website, Alan Jules Weberman, although I do find his writings and conduct to be objectionable and bizarre. Despite my personal opinions regarding Weberman's postings, I am informed and experienced enough to know that closing down a defamatory website is ultimately no more productive than playing a cyber version of Wack-A-Mole. The defamation will simply appear on another website the next day. I am asking you to help me collect a slander judgment against Alan Jules Weberman and set an example. I am also asking you to help my client, Steven Rambam, collect a separate slander judgment that he obtained in New York against Weberman and against Weberman's associate, "Mordechai Levy" (also known as Mark Levy, Mark Levey, Mark Lavey and other names). Please continue reading to find out why you should help. Some time ago I brought a slander and libel action against Alan Jules Weberman, a convicted felon, a drug dealer and a money-launderer1,2 - also known as "AJ Weberman", "Daniel Ben-Tzion" and "Ben-Tzion Daniel" - after he began posting bizarre and defamatory statements about me on the Internet, including claims that I was a sexual deviate and that I had bribed a judge. Weberman had been engaged in a earlier campaign of cyber-harrassment, slander and libel against a friend and professional colleague of mine, Steven Rambam. Mr. Rambam, a legendary private investigator and social activist, had been hired to locate and serve papers upon Weberman's friend and housemate at the time (also a convicted criminal) named "Mordechai Levy". 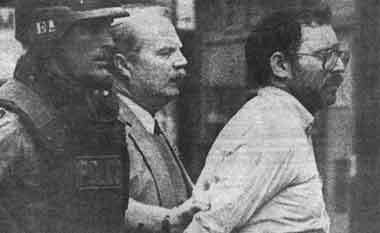 When Mr. Rambam arrived at Weberman's home, Levy grabbed an assault rifle and, from Weberman's rooftop, began firing into a busy Manhattan street in Mr. Rambam's direction. Levy's shooting wounded an innocent bystander (a 69 year old construction worker), who was evacuated under fire by Mr. Rambam and another Investigator. Levy then barricaded himself in Weberman's residence. After being arrested by an NYPD "Emergency Services" (SWAT) unit, Levy was charged with Steven Rambam's attempted murder and other crimes, convicted of Assault 1st Degree and sentenced to New York State prison. Eventually, Mr. Rambam was forced to sue Weberman and Levy to maintain his professional reputation. After a jury trial (demanded by Weberman and Levy), Mr. Rambam of course prevailed and obtained a judgment of $850,000, which is now worth in excess of $1,000,000.00 (One Million Dollars). Because of Levy's and Weberman's connections to California, Mr. Rambam retained my office to enter his New York judgment here and to seize assets located in California. When I entered Mr. Rambam's judgment in Los Angeles County and began the process to seize websites owned by Weberman that were hosted in Santa Monica, Weberman began posting similar websites about me, containing equally ridiculous and slanderous statements. This included a website claiming that I had bribed a judge in order to more efficiently enforce Mr. Rambam's judgment in California. I of course immediately sued Weberman, and I obtained a judgment in the amount of $1.5 Million Dollars. Mr. Rambam and I are now both independently, and very actively, pursuing Weberman to collect our separate judgments. Mr. Rambam is also pursuing Levy and a third debtor, the so-called "Jewish Defense Organization". Weberman's last known address is at 345 East 94th Street, NY, NY, where he may, or may not, currently reside with his wife, Nonet Dapul and his daughter, Sarah Dapul-Weberman. In a recent judgment-debtor deposition, Weberman claimed that a primary source of his income is the so-called "Jewish Defense Organization", which he controls. Levy's last known address is 2922 Nostrand Avenue, Apt. 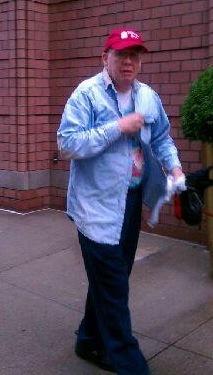 2-E, Brooklyn, NY, where he may, or may not, currently reside with his wife, Bruria and a young boy, possibly his son. When recently deposed, Levy claimed to have no income. If any viewer of this site has knowledge of the current assets, employment or activities of either of the two judgment-debtors, A.J. Weberman and "Mordechai Levy", I ask that you assist Steven Rambam and me in seeing justice done by providing that information to one or both of us. 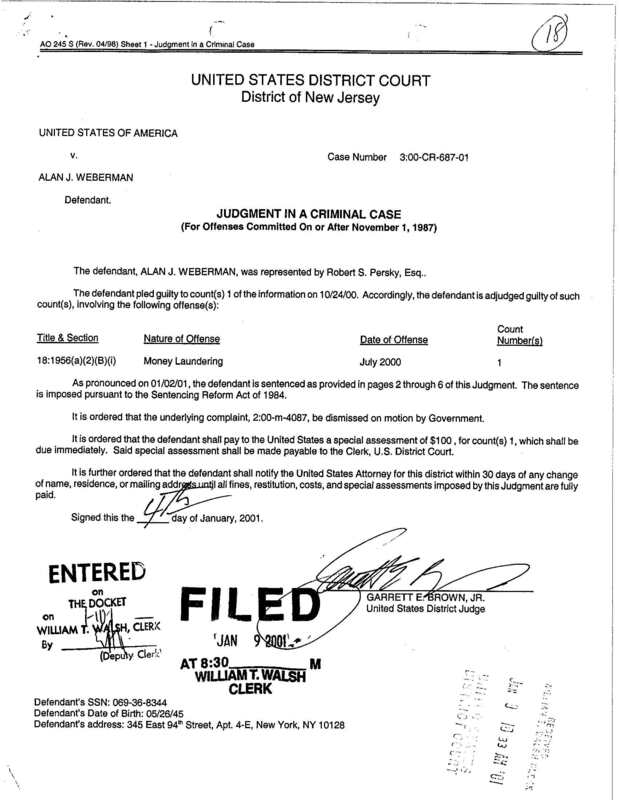 Mr. Rambam's New York attorneys are actively pursuing collection activities, and are using judicial process to formally question Weberman again in the very near future. The questioning will be recorded by a court reporter. As additional information is gathered regarding these judgment-debtors, and as the legal actions against them progress, updates will be posted here and on other websites. 1. 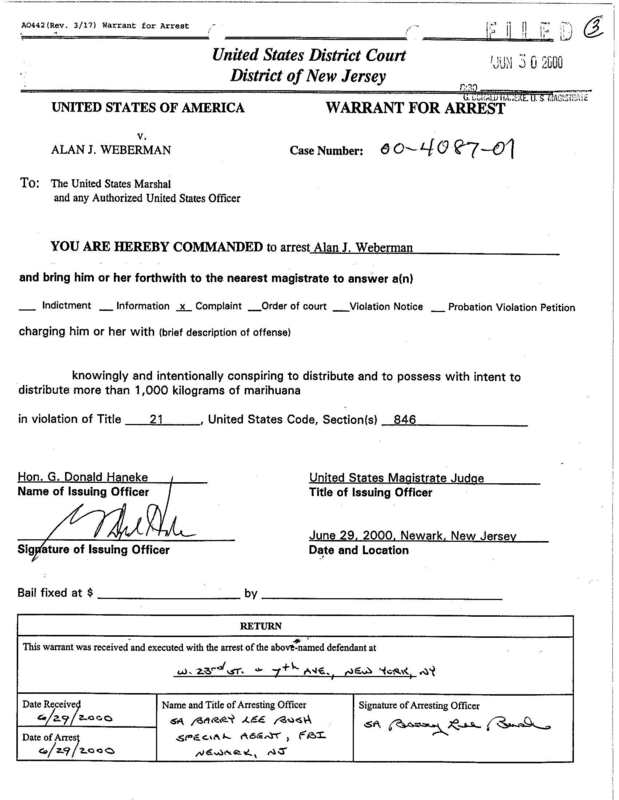 AJ Weberman was also arrested on 11-22-2003 (New York County Index No. 2003NY079537 for NYPL 120.00, Assault With Intent To Cause Physical Injury, upon his wife, Nonet Dapul, and for NYPL 260.10, Endangering the Welfare of A Child. 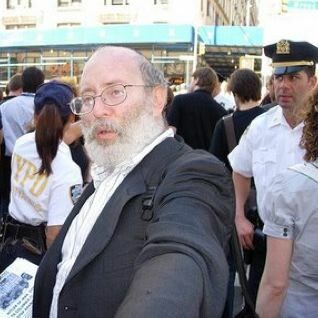 I do not know if Weberman was convicted of those offenses, but he stated to the arresting officer, P.O. Kaloudakis, Badge No. 10138 (per the NYPD officer's statement): "Are you placing me under arrest" How's my wife doing? How's her eye? Is she out of the hospital? Does she know what she's doing? Does she know what this is going to do to me? I'm on parole for money laundering. I don't know what happened last night." 2. 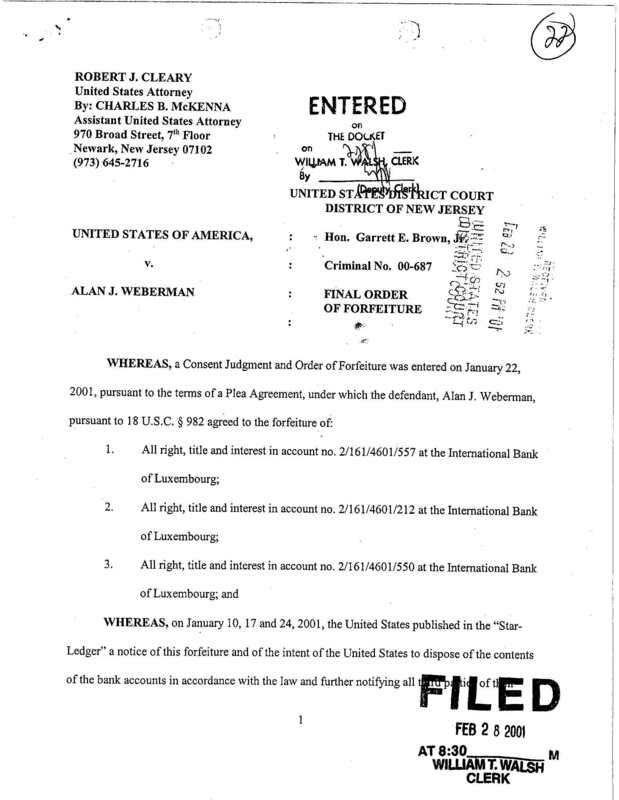 Below are random document scans related to Weberman's federal money laundering - drug dealing arrest.